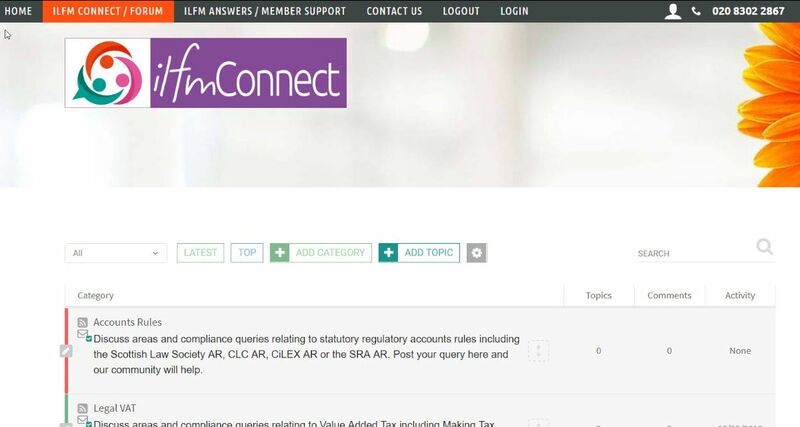 ILFMConnect links you to other ILFM Members via a forum-style portal. Ask questions and get answers from members and from Institute experts and from respected experts in the legal finance profession. This will link you to other members across the country in a community of people working in legal finance. We will be rolling out ILFMConnect to all ILFM Members over the next couple of weeks. We are just completing a Basic User Guide for ILFMConnect which we will make available to you when you get your login. As the system is brand new, it will take time to build up engagement and for the content to grow. Keep checking back to see what's happening. Just hit 'latest' on the front page to see activity or 'top' to see the most active topics. * please note that as this is a different system from our ILFM website – this will not automatically be your ILFM Member Website password – however, you may wish to make these the same for ease of use. ILFMAnswers is also LIVE, and works with the same Login. We are fine tuning the search function, which should be 100% by the time you get your access. ILFMAnswers brings together all our resources, practice notes, answers to queries etc in a peer-reviewed knowledge base. Access can to help you in your day-to-day work in legal finance.